Making Film Negatives from Digital Files. Last year I had a wonderful assignment photographing gnarly, twisted zinfandel vines for Ravenswood Winery in California’s Sonoma and Napa Valleys. As the project took shape, it was decided that because some of the vineyards had a lot of irrigation tubing and other unsightly distractions, the final output would be high quality inkjet prints so that unwanted features could be edited out in Photoshop. That all worked out fine, but Joel Peterson, Ravenswood’s founder, wanted some 16×20 silver prints for his office. Two of those images, alas, had tubing and re-bar included in the scene which were impossible to just touch-out in a print. It was either print the lovelies, “warts and all” or get a crash course in going from film to digital file and back to film. So I chose “crash course.” I knew one of my student friends in Southern California had been getting into this field and we conspired to use my project to work out the details. After a few false starts, we succeeded in going from my original 6×7 BW negative to high-res RGB scan and on to a new 4×5 T-Max 100 negative! Lovely 16×20 silver prints were the final result. Bonus: they needed virtually no spot-retouching because that was all fixed in the digital file! Next I’m going to work on making a BW negative from a color digital image I made in China when I didn’t have access to my 4×5! The bottom line is that I now feel it is realistic to make repairs and adjustments to images that otherwise might be set aside as unusable for silver printing. For pricing and further information on the process contact Ludo Leideritz at Reflective Image Studios. 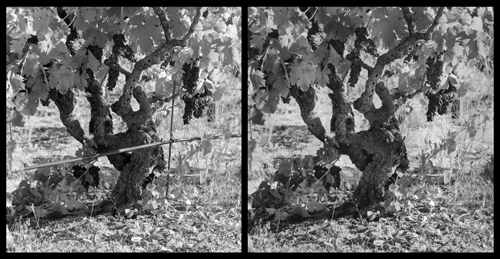 Left: scan from original negative; Right, scan from silver print from digital negative.